New Age Metals Delineates 3rd Lithium Project to Drill Stage on its Lithman West Project in Southeast Manitoba – New Age Metals Inc.
New Age Metals is looking for JV partners for its Lithium division. May 16, 2017 Vancouver, Canada – New Age Metals Inc. (TSXV: NAM; OTCQB: PAWEF; FSE: P7J.F) is pleased to provide an exploration update on the Lithman West Project in Southeast Manitoba. The project is held under NAM’s 100% owned subsidiary, Lithium Canada Development Inc. While compiling the historic geological data for the project areas, several untested geochemical targets were identified. None of the historic work has been verified with a NI-43-101, and therefore is considered non-compliant. The mineral claims were previously held by the Tantalum Mining Corporation of Canada (Tanco), which carried out rock and soil geochemistry in 1977 and between 1999 and 2007. Soil and rock samples were collected at 25 metre intervals on grid-lines 100 metres apart. Most of the historic work focused on the northern portion of the Lithman West Project area, with soil geochemistry completed over most of the project area. Soil samples were analyzed using the Enzyme Leach technique at Activation Laboratory. The lithogeochemistry targets are identified based on enrichment of Lithium, Rubidium and Cesium in host rocks. When pegmatites are emplaced, metasomatic fluids enrich the host country rocks in Lithium, Rubidium and Cesium. The metasomatic enrichment of the host rocks in the case of Lithium can occur up to 100 metres away from the pegmatites, whereas Rubidium and Cesium have smaller metasomatic aureoles. Using the three elements (Li+Rb+Cs) in conjunction and statistically determining background based on rock type, the identification of anomalous and highly anomalous rock types can be used to generate the lithogeochemical targets. This was Tanco’s procedure with regards to lithogeochemistry and all their historical exploration data are available in assessment files at the Manitoba Mines Branch. Pegmatite Field. Six Li+Rb+Cs lithogeochemical anomalies are recognized from compilation of historical assessment files on the Lithman West Project. Lithogeochemistry has only been carried out on the northern portion of the project area by previous explorers. Four of the lithogeochemical anomaly targets have been defined to be approximately 150 metres to 200 metres long and 25 metres to 50 metres wide. These targets appear not to have been drill tested. The two largest of the lithogeochemical anomalies is the Krista’s Pond Anomaly and Bernes Bay Anomaly (Figure 2). The Krista’s Pond Anomaly is tear-drop shaped and approximately 1200 metres long and 150 metres maximum width. This anomaly has not been drill tested, even though it appears to be a moderate to strong lithogeochemical target. The Bernes Bay anomaly on the project area is approximately 1000 metres long by 1500 metres wide. Previous work indicates that this anomaly extends eastward to the westernmost bay of Bernic Lake. This anomaly was considered to be a high priority target in 1977 and was tested with three shallow drill holes. Seven soil Enzyme Leach anomalies have been defined from compilation of past Tanco exploration work (Figure 2). These anomalies are varying shapes and sizes. Areas where the soil and rock geochemistry overlap or nearly overlap are considered to be the highest priorities for follow-up drilling. It is recommended that a diamond drill program be carried out in order to drill test the soil and rock geochemical anomalies (Figures 1 and 2). These are drill ready targets based on the historic geological exploration. In addition, it is recommended that follow-up geological work be carried out over the anomalies and that rock lithogeochemistry be completed on the southern portion of the project area. 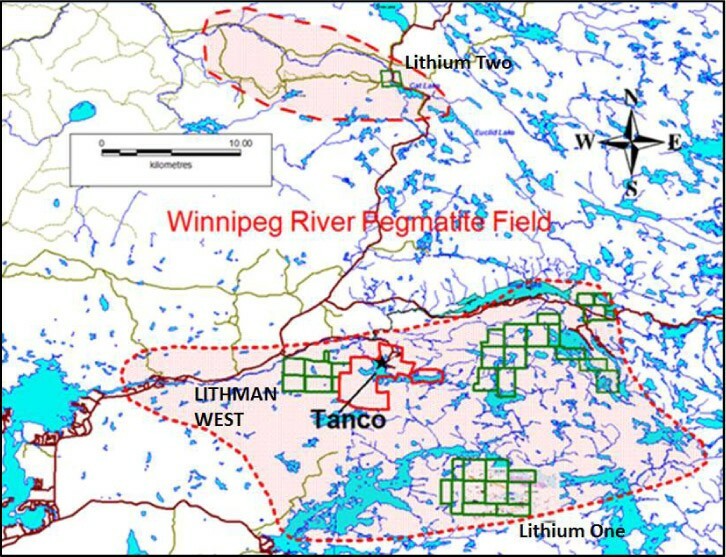 The Company has five Lithium Pegmatite projects in the Winnipeg River-Cat Lake Pegmatite Field of Southeast Manitoba. This pegmatite field (Figure 3) is host to the world-class Tanco Pegmatite, a highly fractionated Lithium-Cesium-Tantalum (LCT)-type pegmatite, which has been mined at the Tanco Mine for Lithium-bearing minerals (Spodumene), Tantalum, Beryllium, Rubidium and Cesium since 1969. There are no current NI43-101 compliant reports, but academic reports suggest that the Tanco Pegmatite prior to the start of mining was approximately 1520 metres long, 1060 metres wide, and up to ~100 metres thick with a volume of ~21,850,000 m3 and a mass of ~57,430,000 tonnes. Numerous other lithium-bearing pegmatites exist within the pegmatite field. The Company has two other drill ready targets for lithium-bearing pegmatites in the Pegmatite Field (News Release Feb 22nd, 2017). To date, the Company has approximately 6,318 hectares (15,612 acres) of mineral claims, with Lithium Mineral Potential in the Winnipeg River-Cat Lake Pegmatite Field of southeast Manitoba. NAM is the largest mineral claim holder in the Pegmatite Field. As part of Company’s Prospector Generator Model, negotiations are currently ongoing with interested 3rd parties for possible Option/Joint Ventures and other Exploration Initiatives. NAM’s flagship project is its 100% owned River Valley PGM Project (NAM Website – River Valley Project) in the Sudbury Mining District of northwest Ontario (60 kilometres due east of Sudbury, Ontario). Presently the River Valley Project has Measured + Indicated Resources of 91 million tonnes @ 0.58 g/t* Palladium, 0.22 g/t Platinum, 0.04 g/t Gold at a cut-off grade of 0.8 g/t for a PdEq of 2,463,000 ounces PGM plus Gold. River Valley PGM-Copper-Nickel sulphide mineralized zones remain open to expansion and is undergoing continued exploration. The contents contained herein that relates to Exploration Results or Mineral Resources is based on information compiled, reviewed or prepared by Dr. Bill Stone, Principal Consulting Geoscientist for New Age Metals Inc. Dr. Stone is the Qualified Person as defined by National Instrument 43-101 and has reviewed and approved the technical content.